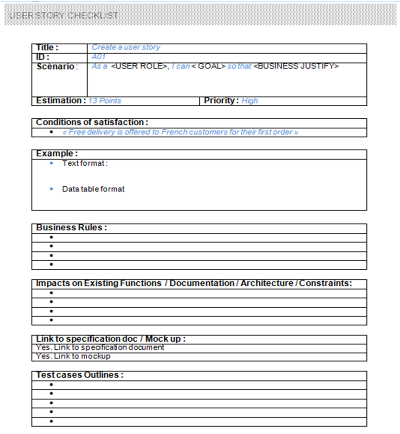 A user story is a requirement of the system to be developed, a brief description of a feature as viewed by the user (Role → Goal), very popular on Agile projects. Each user story must be estimated (by the team) and prioritized, but also SMALL ENOUGH to be delivered in a sprint (usually smallest teams take at least 3 stories per sprint). This is a necessity if you want to observe real benefits in terms of value delivery, visibility, flexibility, feedback and continuous improvement. During my agile coaching activities, I am regularly asked to help the team and Product Owner to split user stories into smaller ones. The user performs a task according to a well-established workflow. 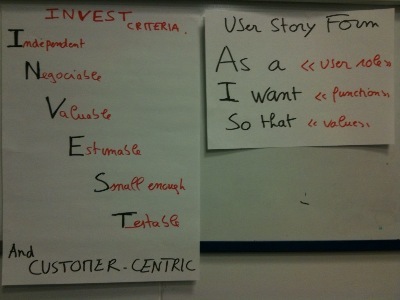 The large user story is split according to these steps in order to be developed incrementally. Each step has its own user story. The case is more precise, you divide the story according to a specific sequence in a scenario. 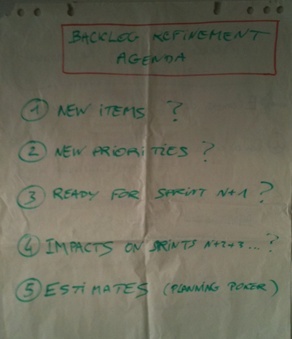 Splitting a user story by operations is often the most obvious way to decompose. A CRUD (Create, Retrieve, Update, Delete) feature is a good example. Separate the CRUD or group two operations in a user story may be appropriate … to create an account, to view it, edit it and delete it. Variations in terms of material or not, on configurations but also in terms of input means or User Interface can lead to new and smaller user stories. This time, you choose to break down the user stories based on the role or the persona who will use the product. This is a very good option easy if you use the user voice format or the Persona approach. The story mapping activity is a good way to visualize it. For example a user story can describe a feature in the simplest way of implementation, others will follow by a greater level of complexity or detail. 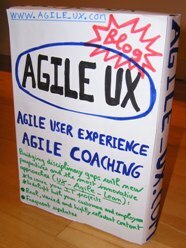 Use cases – User Stories: so precious but not the same ! Use cases and user stories are two popular ways to capture functional requirements. They’re both goal-oriented (a very good thing), can be discovered during user / customers workshops, can be easily combined with UX activities, and are used in Agile contexts. A user story is a brief description of functionality as viewed by the user (Role → Goal); it doesn’t model the interaction between the actor and the system, what the use case does. A user story is not a sequence of actions. A user story is short and consist in one or two sentences written in the language of the user (example: As a recruiter, I can submit job vacancies). A role and a goal, then it is discussed. A use case is heavier, richer in information: goal, summary, actor, precondition, trigger event, main success scenario and extensions (alternative paths, errors …). Use case is (too much) detailed. User stories are used for planning. They play a major role in project estimation and planning (via story points and velocity). Use cases are not used for planning, even if you can use « use cases points » technique to estimate project size. User stories are based on verbal communication and rely on collaboration, discussion and proximity to clarify details. Use case is a textual model (associated with diagrams): every thing is written ! User stories are in theory written on cards (remember the 3 C rule: Card, Conversation, Confirmation): they’re not intended to be archived unlike use cases. Use cases provide a more holistic view of the system: precondition, UC diagram, sub use case. Linking user stories is less obvious. This is also a reason why UX and IxD activities are so important in agile contexts ! Finally, Use cases and user stories were originally associated with two different methodologies (Unified Process vs eXtreme Programming). But both can be used with agile methods and unified process ! I have almost a ten years experience with use cases. Alistair Cockburn’s book « Writting effective use cases » used to be my bible for years… but now, my preference tends to go to user stories model. And this is usually my recommendation to Agile Teams.